The gate outside the small shrine near our apartment. I went to offer thanks today for visa renewal. I stopped at the local shrine today to offer thanks for my visa renewal. The gate and the ginkgo leaves made me stop. 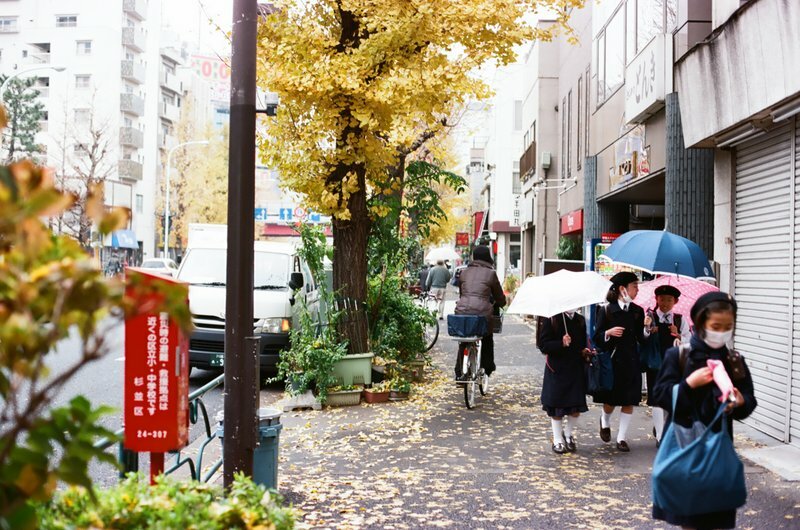 Because fall remained warm in Tokyo, the fall foliage extended all the way to the end of the year. The last few leaves are dropping now. Here’s the view from entrance to the Tokyo Metropolitan Gymnasium out towards Shinjuku Gyoen, the elevated freeway, and the Sendagaya station. 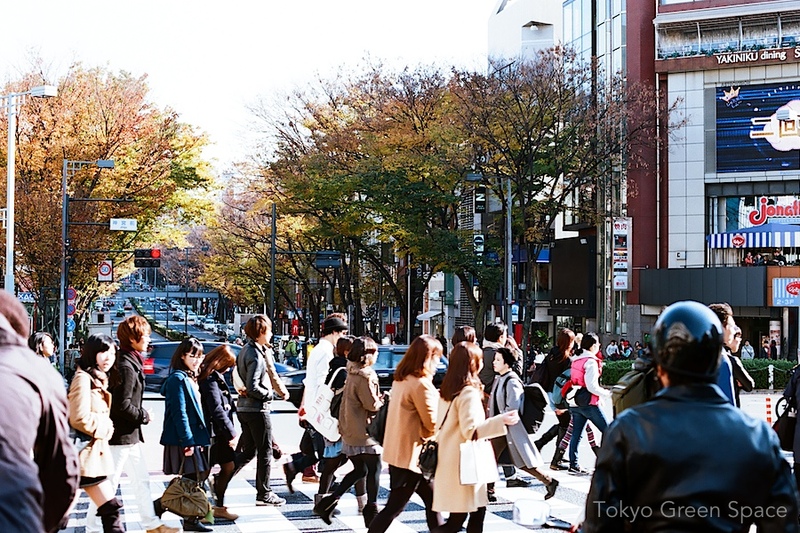 Many foreigners are surprised just how full of persimmons Tokyo is in the fall. Maybe you’d miss them if you stick to inside the newest malls and corporate developments. But it must be one of the most popular residential trees, and a true marker of fall. This one is behind Shiho ceramic studio, and the funny story is that my in law teachers say that this year there aren’t so many fruit. Despite being an off year in a two year cycle, there’s actually still quite a lot of fruit. My mother in law is a great cook, and she uses these fall persimmons and also small sour plums in summer for food she shares with students and friends. She didn’t plant these trees but has gotten a lot of use from them in the past ten years. Some persimmon trees produce fruit that’s best eaten raw, others dried, or cooked into jam or other sweets. For me it’s an acquired taste, but seeing these orange globes dangling across Tokyo is undeniably beautiful. 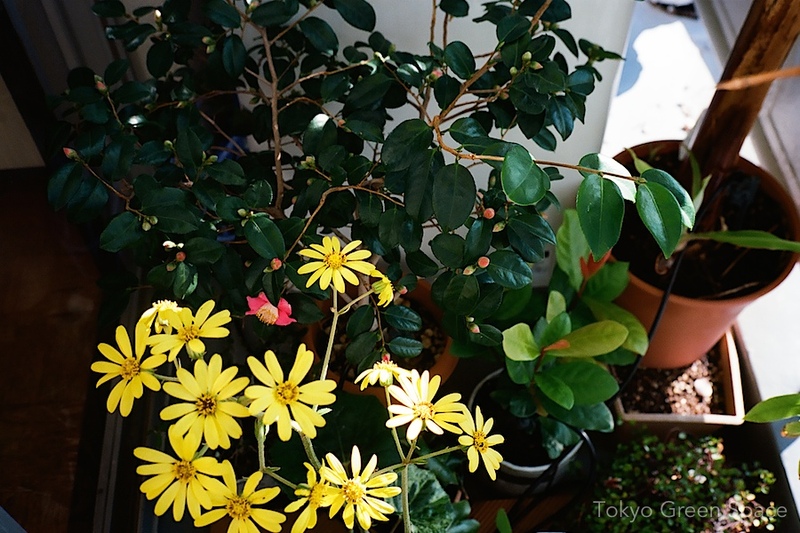 My friends John and Ruth McCreery sent me these wonderful photos of their guerrilla garden in Yokohama. The McCreery’s adopted a neglected patch of land between the road and the parking lot of their large residential complex. I like how they captured the odd feeling at New Year’s in the Tokyo region when you see plants typical of all four seasons all thriving. Plants that I recognize include large leafed taro, red maple leaves, and blooming daffodils. Maybe nothing is more typically winter in Japan than the presence of all the other seasons! To me, the taro plant is hysterical. People dump unwanted plants (and other things) in our guerrilla garden. The taro is one. It landed near the compost heap, and thrived. 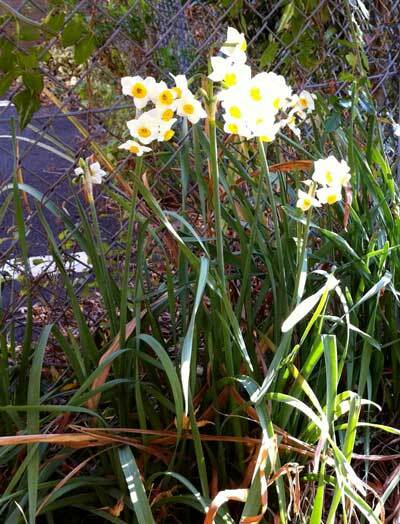 Soon it was crowding out the Japanese iris, but it was so vigorous that we hated to axe it. Transplanting a fairly large plant can be tricky, so we waited until last February, when it was seriously cold, dug a big hole, filled it with the compost it loved, and moved it over there. We then watched anxiously, wondering if it would accept the move, if the wind in the new spot might discourage it–or blow it over–or if it would continue to grow. It’s about doubled since then!